Gabe Parks and Josh Shreve (l to r in photos above) were selected by the coaches as the Summer 2018 most outstanding Blackhawks. 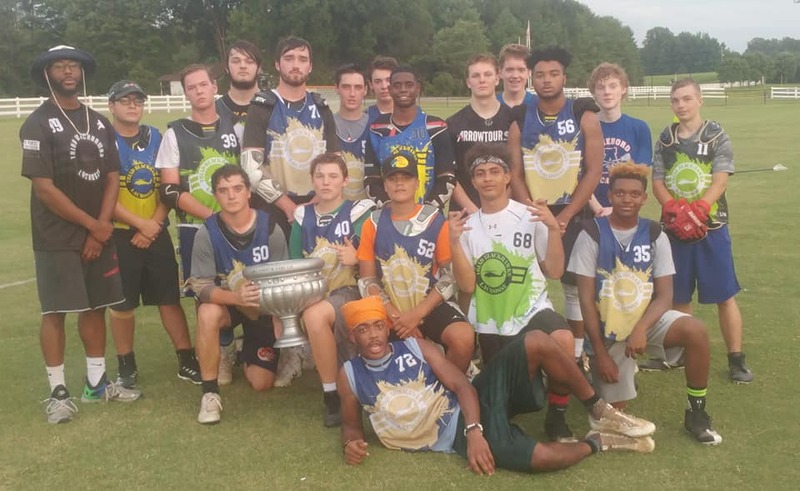 Parks, a rising senior goalie at Asheboro HS, showed outstanding commitment in the cage in both the HOTT Lax league and for the Blackhawks summer travel team. He saved 55% of the shots against him in the HOTT Lax league, was the winning goalie (6 saves on 9 shots) in the HOTT Lax championship game for The Commission, and had the lion's share of time in cage for the Blackhawks travel team in the Southern Sizzle and in the Freedom Cup. Gabe's reliability, commitment (40-minute drive to and from Zoo City each day), and steady presence in goal earned him the coaches' respect and admiration. Congratulations to Gabe Parks and Josh Shreve on this well-deserved honor! COMMISSION RECOGNITION! Inspired by an earlier FB post that the top seed "rarely" wins the HOTT Lax playoffs, the top-seeded Commission got 4 goals from league scoring leader Josh Shreve and 6 saves on 9 shots on cage from goalie Gabe Parks in front of a stout defense to cruise to the 2018 HOTT Lax title, 7-3, over the War Dogs in the June 28 title clash at Ivey Redmon. The title game matched The Commission's league-best offense against the league's stingiest defense. After a back-and-forth first half, the workmanlike Commission pulled away in the second half. The Commission had earlier earned a surprisingly-close 6-3 semifinal win over a spirited Team Esskeetit. The championship completes an 8-1 season for the champs, their only loss coming in week 3 against the War Dogs. Congratulations to Coach Shannon Robinson and The Commission (pictured below) on a well-deserved championship!